What a man Jesus of Nazareth was, and we see all of his glory in the last week of his life. From Palm Sunday to Resurrection Sunday we Jesus entering into Jerusalem as the king of the Jews, the preacher telling the Pharisees they are truly missing the mark in God’s kingdom, the friend humbling himself as he washed his apostles’ feet and allowed a friend to betray him , the sacrificial lamb who voluntarily was beaten and killed on a cross for our sins , and the risen savior who conquered sin and death. 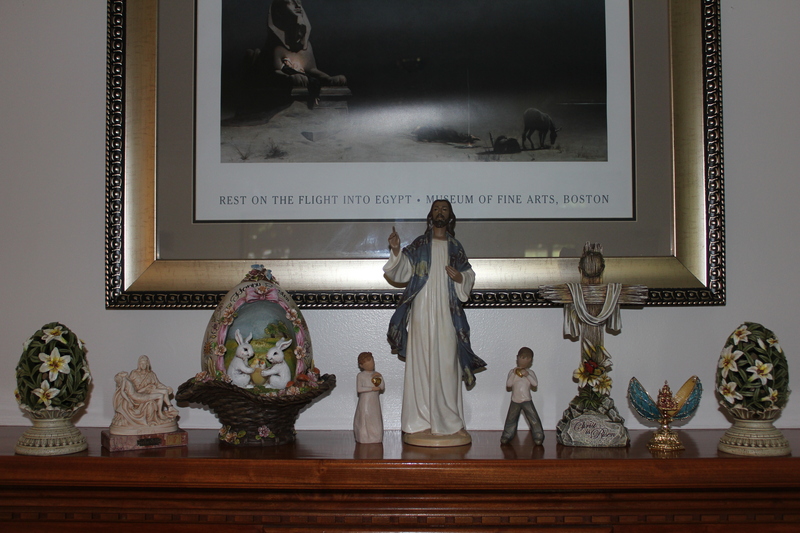 I hope you enjoy this small menagerie of nick-knacks that I put together. I know eggs, rabbits, and chicks are not in the “Easter Story” of Jesus, but they are a part of our Christian culture and how we can celebrate the beauty of spring and new –life with the new life Jesus the Christ had for himself and provides to all of us. Love the menagerie. My willow tree man and woman holding each other was knocked off the wall during the last thunderstorm. The man’s head was broken off. I threw it away instead of reglueing it. I thought me holding a faceless/headless man was very appropriate….Who is the man that will let me love him in my own way and return love in his? You will get there, Jennifer. We love you . Thank you for reminding us of what we are truly celebrating this Easter. Our Minister of Music told us tonight that Good Friday is just as important as Easter. Good Friday is when God paid for our sins on the cross and he confirmed it by rising from the dead on Easter morning. Praise God from whom all blessings flow. I hope the kids will have a grand time hunting easter eggs and eating all that yummy candy. …And thank you for the kind note. Yes, we do plan to have a fun and blessed Easter. Carter and Ammon are practicing hiding eggs for Sunday. ;o) We love you all as well, and we hope you, Bobby, Adam, and Dot have a great Easter. I get to hide the eggs at church! All right, Hannah! We are looking forward to it! Here is the link to a little ‘gem’ of a museum. What a great place to take children on the Sat before Easter (do call and make sure they are open) or in the spring! Go up Cleveland Highway from Dalton and turn (I think) at a place called Manis Grocery. There is a sign to turn RIGHT at the grocery, if you are headed north. Apparently, the founder was an artist/art teacher for Whitfield Co Schools. He is elderly and has Alzheimer’s now, but his son and grandson run it. They still craft beautiful eggs and nests. Here is the link to the art studio in Cohutta. Do look at the portfolio at the exquisite eggs!